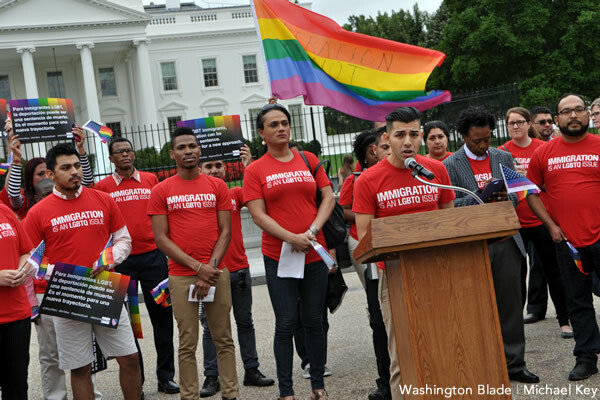 Following news that President Obama won’t take executive action on immigration until after Election Day, activists rallied before the White House on Tuesday to call for an immediate change to help LGBT people facing unfair or discriminatory treatment under the current system. Speakers at the rally, which was attended by about two dozen people, consisted of advocates from LGBT organizations as well as LGBT immigrants who shared personal stories of harassment or discrimination they’ve faced both in the United States and overseas. One speaker, who went by the name “Jose,” is a 25-year-old gay man who now lives in California after he fled El Salvador at age 17. In his home country, he was attacked and sexually abused by homophobic gang members, who at one point put a gun to his head and threatened to kill him because he’s gay. Although he since has been granted asylum, he faced harassment in this country when he was arrested by immigration officials last year and sent for five-and-a-half months to a detention center in South Texas, where he was threatened with deportation back to El Salvador. Read the full article at the Washington Blade.